At The Blue Elephant, we strive to create a rich, supportive and nurturing learning environment that helps every one of our little learners thrive and grow into the best person they can be. We’re proud to provide a high-quality early childhood learning experience to children throughout the Frisco, TX area, and we strive to foster the holistic development of all of our students. With a research-based, progressive curriculum that helps students grow from wherever they are, we provide a world-class learning experience to students from infancy to pre-kindergarten. 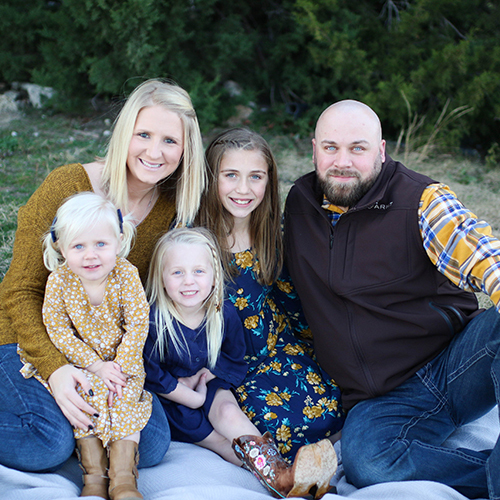 Clay and Meredith Carpenter discovered they had a passion for providing caring services for other families’ children just as they do for their own. Meredith has an elementary education degree and brings many years of professional experience to The Blue Elephant. Clay is a Captain with the Frisco Fire Department and earned the Paramedic of the Year award. Read an article about the pair by clicking on the download link below! Also, view some of Ms. Mer’s Favorite Things! My name is Ms. Kelly & I am so excited to be TBE’s Director! I knew from a young age that early childhood education was my passion. I moved from Alaska in 2008 and have called Texas my home ever since. I’m happily married, have three amazing daughters, and one dog at home. When we aren't busy with school and work, we like to spend time outdoors camping, dirt-biking, or just hanging out together. I have been with The Blue Elephant since the fall of 2013 and immediately felt like family. I am overjoyed to be a part of this adventure and can’t wait to see how much we grow this year! We truly believe that an organization is only as good as its people, which is why we've worked hard to select a team of some of the most skillful, kind, and compassionate people in early childhood education. Every member of our teaching team is here for one reason – they truly love helping kids learn and grow! 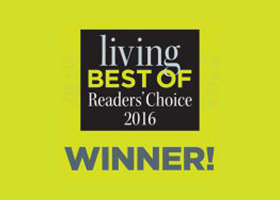 Take a look below to get to know the TBE team and find out what makes our staff the best in Frisco! Join the TBE Family Today! Early childhood is one of the most important formative periods in a child's development, and at The Blue Elephant, we're committed to ensuring an excellent experience for all of our students. We combine a supportive, nurturing environment that instills fun in every activity with a research-based curriculum designed to help our children grow holistically, providing a truly superlative early childhood education experience to all of our little learners. If you'd like to find out more about The Blue Elephant or have any questions for us, we're always happy to talk – just call us at 469.287.0332 or shoot us an email at info@theblueelephant.com. Or, if you're ready to give your child the best early childhood learning experience around, we'd love to have you join the TBE family! No matter what age or stage of learning your child is in, we're looking forward to helping them grow into the best person possible. 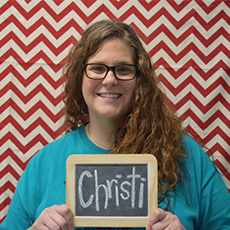 My name is Ms. Christi and I am so excited to be one of your teachers on the Pre-K team! I graduated with a master’s of education, with a concentration in early childhood education and curriculum/instruction from Concordia University. I have worked with children for over 18 years and have been at TBE since February 2013. I really love being a part of The Blue Elephant family! I am more than excited about our year and all the amazing things we will experience together. Hello TBE family & friends! My name is Ms. Tammy and I come to you from Montreal, Quebec in Canada. After studying languages in college, I moved to Toronto, Ontario where I met my husband. We now have three wonderful children and moved to Frisco in 2010. While all of our family still lives up in the “great north,” we love our new family here and are thrilled to stay and call Texas our home. I am so excited to teach your wonderful children and can’t wait to see what great things we will learn this year! 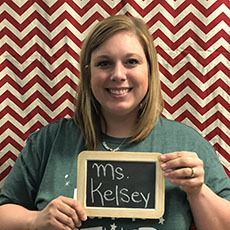 My name is Ms. Kelsey and I will be your lead teacher in Outdoor Circus Room. You will also see me in the front office as one of the administrative team members in the evenings. I grew up in Broken Arrow, Oklahoma. Boomer Sooner! I have also lived in Pennsylvania for my husband’s work, but now we call Frisco home. My husband and I have two beautiful daughters, Paisley and Hadley. They are my heart and soul and definitely daddy’s little girls! I have worked at TBE since 2012. I love all my babies that come through my class and I am always excited to see how much they grow and learn each day! I am thrilled to be a part of such a wonderful school and to help little hearts and minds grow! 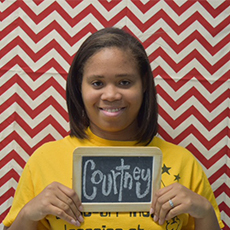 My name is Ms. Courtney and I am so excited to be a part of the 2’s team! I am originally from Chicago, but I now reside in Frisco with my husband and son. I am very excited to be working at TBE! I have been working with children for close to a decade and have loved every minute of it! I have a CDA in Early Childhood Education for infants & toddlers and have worked with all age groups. It is a pleasure to work with your little ones and I couldn't be any happier making memories with them and watching them grow every day! 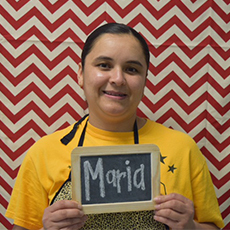 My name is Ms. Maria and I am so happy to be a part of TBE! I work in The Blue Elephant kitchen and provide all meals and snacks to our wonderful kids at TBE! I enjoy seeing all of the children’s smiling faces each day as I visit their classrooms! Outside of TBE, I am happily married and I am blessed with four wonderful children. I am originally from Mexico, but I have lived in Frisco for 19 years! 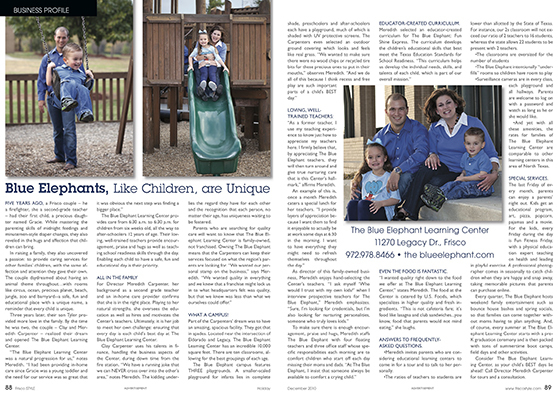 I love The Blue Elephant and I love being a part of your child’s day! 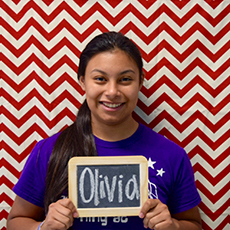 My name is Ms. Olivia! I was born in Dallas and have lived in Frisco for most of my life. I’m currently attending Collin College and in my spare time I like to stay home & relax, visit with family, and go shopping! I started working at TBE in May 2014 and love getting to stroll around my little babies each day! My favorite things about TBE are the families we serve and the wonderful teachers that I work with everyday. My favorite activity with the babies is music time! I am so excited to be at TBE and am looking forward to making many more memories. 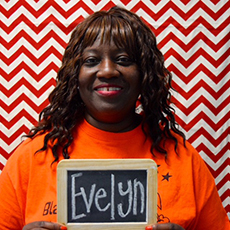 My name is Ms. Evelyn and I am the Lead Teacher in Precious Planet Safari! I am a native Texan, but I’ve enjoyed living in various places including “all things Disney” Orlando, Florida. I earned my Bachelor of Science degree in sociology from the University of Houston and I have experience in corporate training, early childhood education, and public education. I LOVE working with children and I have a true passion for teaching. When I’m not teaching, my hobbies include singing, genealogy, and volunteering with local youth groups. I also love spending time with my family and keeping up with our active twin daughters. I am so glad to be here and love being part of The Blue Elephant family! 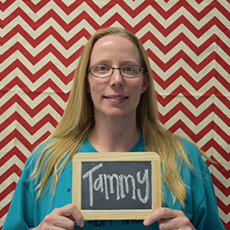 My name is Ms. Amy and I’m excited to be a teacher at The Blue Elephant this year. Born and raised in sunny southern California, I’m nothing short of a city girl. After studying education at Snow College in Ephraim, Utah and at Brigham Young University in Idaho, I returned home to California for my first teaching job. 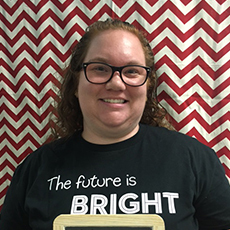 In 2015, I relocated to Melissa, Texas with my family to attend the Montessori Institute of North Texas. I’m excited to see what adventures this year holds and I can’t wait to get to know each one of you. 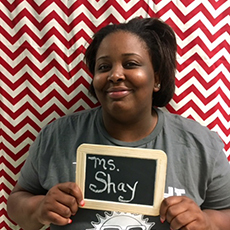 My name is Ms. Shay and I am the lead teacher in Indoor Circus. I grew up in the suburbs of Chicago and furthered my education at Southern Illinois University Carbondale. After years of schooling and experience within the Carbondale community, I relocated to Dallas. I love working with children and I enjoy being a part of The Blue Elephant team. I am looking forward to getting to know each one of you, please feel free to come see me anytime. 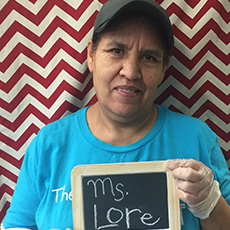 My name is Ms. Lorenza... but you can call me Lore! You will see me helping in the kitchen, and keeping the school clean and tidy for all the precious little ones! I am originally from Mexico, but have been in Frisco for 26 years! I have been happily married to my husband, Luis, for 31 years. We have 3 lovely kids..... John, Zoraida, and Samantha. We also have 2 playful dogs and 3 wonderful grandsons. I feel so blessed to be here at TBE! I love The Blue Elephant and love being a part of your child’s day! 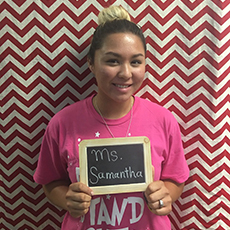 Hello, my name is Ms. Samantha! I am so excited to be one of your child’s teachers on the 2 year old team! I was born and raised in Little Elm! I currently live in Pilot Point with my husband and two sons. My boys, Noah and Axl mean the world to me! I am so excited to be a part of The Blue Elephant team! I can’t wait to get to know each and every family! I am looking forward to working with every child to reach their full potential! 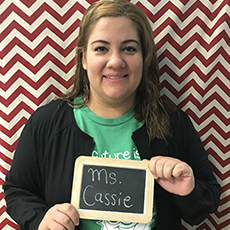 My name is Ms. Cassie and I’m so excited to be a toddler and Kids’ Club teacher at The Blue Elephant! I am proud to be a native Texan and always cheer for the home team! Go Cowboys! Go Rangers! I live in Frisco with my two amazing daughters, Aubrey and Bella. I love working with children and I have over five years of experience in a learning center environment. I am very excited to be part of team TBE and I’m looking forward to all of the educational experiences we will have! 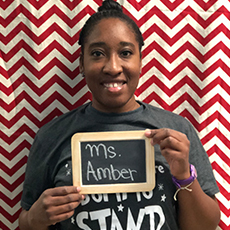 My name is Ms. Amber and I am excited to get to know your child! I am a native Texan and a graduate of The University of North Texas! I received my degree in Elementary Education in 2010. I have a passion for working with young children. I believe influencing and teaching little ones is not a job, but a rewarding career. I cannot wait to meet and build a bond with the families and children in my class. Let’s grow together at TBE! Hello! 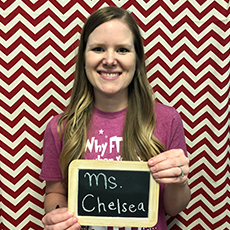 My name is Ms. Chelsea and I am so excited to be part of TBE’s family! 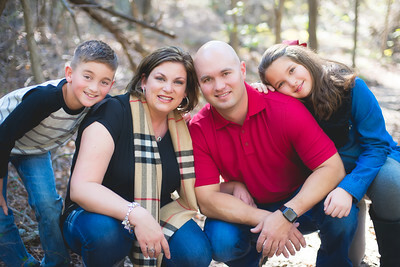 I was born and raised in Plano and I currently live with my husband, Mike, and our sweet baby girl, Carey, in Little Elm. I earned my teaching degree from Texas Tech University... Go Red Raiders! I have taught for many years and I love the time spent with my kiddos! I am so thrilled to be part of the School Readiness team and look forward to all of the educational adventures we will have together! 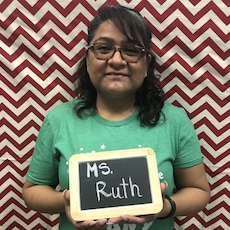 My name is Ms. Ruth and I am one of the infant teachers at TBE. I was born in Mexico, but I grew up in beautiful California. I married my sweet husband in 2000 and we moved to the great state of Texas in 2004. We love it here! We have two wonderful children who keep us busy, but very happy. Both of my children attend Lone Star High School (Go Rangers!!!) and my daughter will soon be a graduate! Yay!!! My passion has always been children; I have worked with kids for over 10 years! I feel blessed to be able to watch these sweet littles grow and learn each day. Thank you for letting me be a part of your child’s journey! Come see me anytime! Hello! 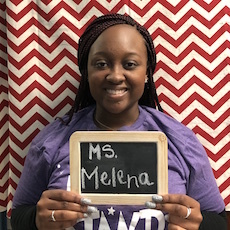 My name is Ms. Melena and I am an assistant teacher at TBE. I grew up in the windy city of Chicago, but moved to Texas during high school. During my four years of high school, I danced on the drill team and spirit squad. Go Hawks!!! I have worked with children for two years and I love every minute of it! I am beyond blessed and excited to be a part of The Blue Elephant family! I cannot wait to see where this journey takes me throughout this year and all of the years to come! 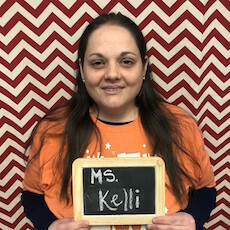 My name is Ms. Kelli and I’m so excited to be at TBE! I was born in California, but my family moved to the Lone Star state in 1995. I have a deep respect for law enforcement and I wanted to become a police officer after I graduated high school, but I ended up following my other passion, teaching. I absolutely love teaching and I have taught for almost 20 years! I am married to my long-time sweetheart and we have two beautiful daughters, Jessie and Jordan. It is a true blessing to be at TBE and I look forward to meeting you all!